When Walker staff began planning the celebration of our 75th anniversary as a public art center, most discussions revolved around what could be done to feature the museum’s collections. This approach makes sense since the collection is what remains with an institution for the long term. What was interesting for me as a curator of architecture and design is that the Walker does not have a specific collection in this area. This will probably come as a surprise for many people since the Walker has been presenting architecture and design since 1940—it was a founding discipline within the art center. Of course, there are a few design artifacts and works by architects and designers in our permanent collection—Frank Gehry’s Standing Fish, most publicly, for instance, or objects acquired from various exhibitions about design that the Walker has organized over the decades. The reasons for such an omission are varied, but this void within the Walker’s Collections remained seemingly insurmountable at least in the present context of an impending collections-based celebration of the institution. Faced with this challenge, I reflected back on a project that was initially presented as part of a design history conference I organized in the late 1990s for the now-defunct American Center for Design in Chicago. Dubbed “ReMaking History,” it featured new takes on how history could be undertaken and presented, and was notable because most of its participants were themselves practitioner-historians—enthusiasts, educators, and designers who were often engaged in issues of history, theory, and criticism and who often operated within academic arenas. 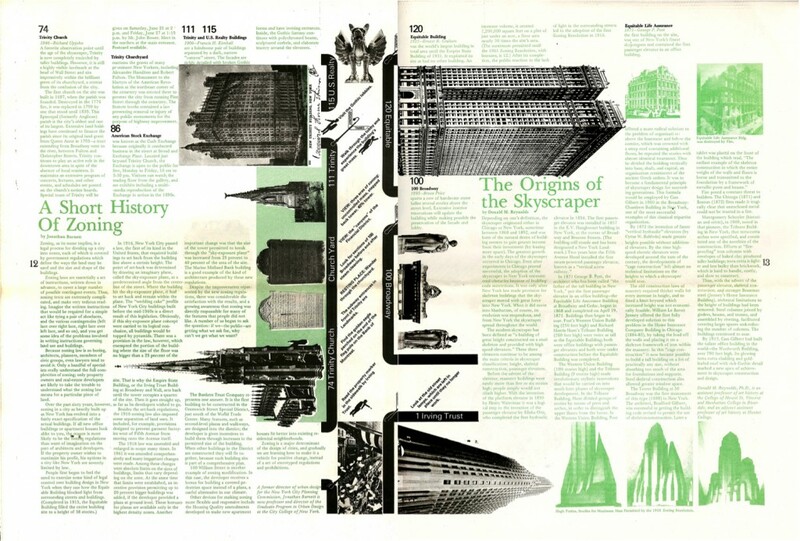 I recalled a project by Michael Rock, Susan Sellers, and Georgia Stout (now 2 x 4) in New York who proposed turning the city itself into a kind of open-air design museum. Branded the Museum of the Ordinary (MO) it called for various artifacts of design to be presented in-situ—seen as a part of everyday life and not removed from this context and placed in a museum vitrine. Being practitioners, they brilliantly illustrated the possible ways in which such objects could be “called out” in the environment in which they were essentially invisible as things worthy of a second look or even a second thought, such as a mobile advertising van that would pull a billboard through the streets welcoming visitors to the “museum,” or using the ubiquitous mesh construction scaffolding wrap, which could be printed with object label information about a chosen building—cloaking its appearance and thus drawing renewed attention to it. Although smaller scale iterations were undertaken, their larger scale vision has yet to be implemented. 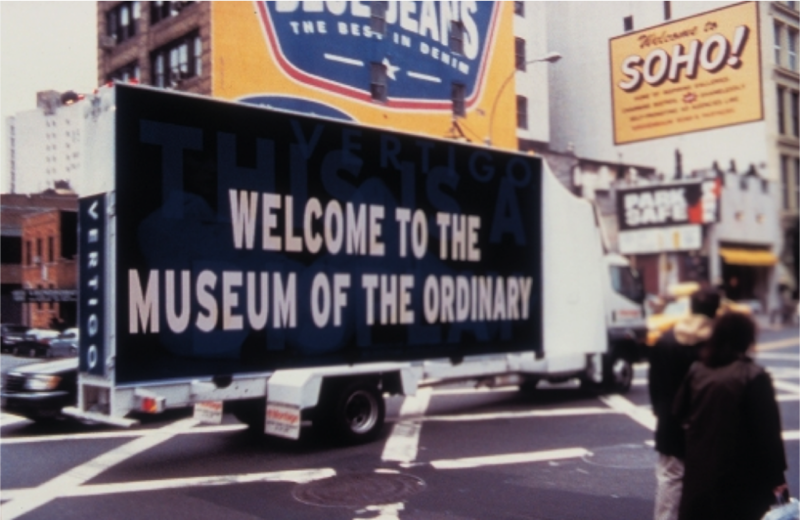 The brilliance of what they proposed as the Museum of the Ordinary allowed for artifacts to remain where they were and in the context of their “useful” lives, but it also allowed for the inclusion of what I call “the uncollectibles”— landscapes that change over time, too vast to be expropriated by a museum; immovable buildings, too big to move; objects that by their nature are fugitive, ephemeral, perishable, or no longer extant; and largely immaterial things like services or concepts that do not exist as physical artifacts, or digital objects that live a precarious existence in terms of the future conservation requirements that collections require. Another important predecessor to this project was one created in the summer of 1975 called Immovable Objects. It was created by Studio Works, a practice composed of architects Robert Mangurian and Craig Hodgetts and graphic designer Keith Godard, for the new Cooper-Hewitt, a design museum of the Smithsonian Institution in New York City scheduled to open in 1976. An “outdoor exhibition about city design” Immovable Objects took as its site lower Manhattan from Battery Park to the Brooklyn Bridge. Essentially annexing both the iconic buildings and more banal bits of infrastructure found in the area, Immovable Objects offered its visitors a walking tour of the city, facilitated by the production of an exhibition catalogue—in this case a newspaper complete with routes, building information, and essays on related topics, such as the evolution of architectural styles in lower Manhattan, the nature of public space in the city’s new plazas, or how zoning codes have shaped the city. The inaugural festivities included a parade whereby architects and designers chose their own or a favorite building to reimagine as a costume to engage passersby. Design museums (as well as contemporary art museums who faced some similar issues years ago) are tackling some of these challenges, trying to collect the uncollectible. Leading the way is Paola Antonelli at the Museum of Modern Art in New York who has been trying to “acquire” a 747 airplane, which would still be in service but might have, for instance, its acquisition number on the side of the plane. Those that have been to MoMA know they already own a helicopter, and, of course, the Smithsonian Air and Space Museum routinely contends with such massive objects. However, the “live” nature of the object still flying from port to port takes it to a different level. Antonelli’s acquisition of the @ symbol pushes the boundaries of whether an object needs to have a definite or fixed form. Letterforms and characters by their nature exist independently of any particular typographic representation, so what was collected in this case was not a particular font but rather a piece of language, a graphical concept. The Cooper-Hewitt National Design Museum in New York recently acquired its first digital application, Planetary. This raises immediate questions of conservation, especially as the technical support structures that host such apps (operating systems, web browsers, programming code, etc.) evolve and change in the future. Interestingly, they placed the code for this app online at GitHub, where people can study it, but also add to it and help conserve it for the future—tending it much like open-source software. Museums have also been collecting other buildings, such as the Indianapolis Museum of Art’s purchase of Eero Saarinen’s mid-century modern masterpiece, the Irwin Miller residence in Columbus, Indiana, or closer to home, the Minneapolis Institute of Arts acquisition of the stunning Purcell-Cutts house a few miles away on Lake of the Isles. In response to this context and these kinds of questions, we launched Minnesota by Design, a new online initiative that takes the form of a website to document the rich landscape of design across the state. The project seeks to increase public awareness of the human-built environment in Minnesota—its landscapes, buildings, products, and graphics, both past and present—and the role that design thinking and practice plays in its realization. This virtual collection has been seeded with some 100 designs that reflect exemplary instances of practical ingenuity, creative thinking, beautiful form-giving, social and cultural impact, and innovative uses of technology. We’ve included descriptive texts about each selection, like the kind you might find on the gallery wall in a museum exhibition. 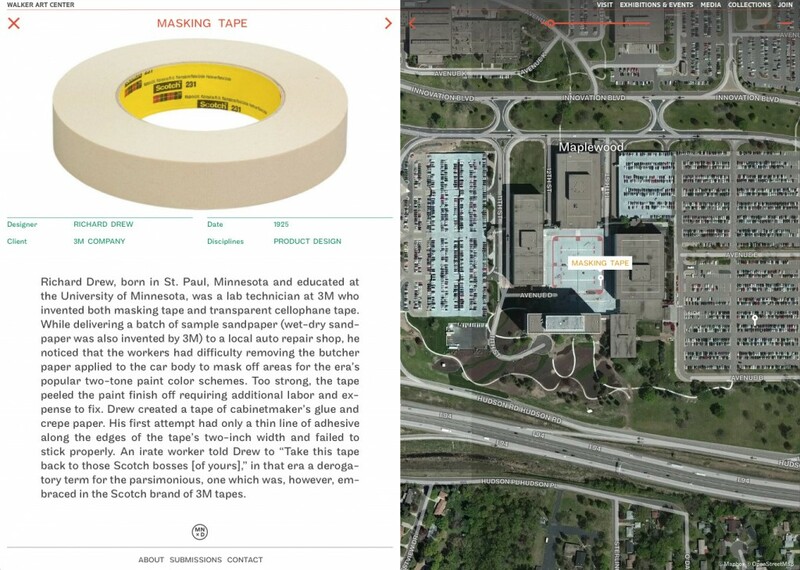 Taking advantage of its online nature and the fact that we are limited to Minnesota, we locate each project to the extent that is possible on a searchable map. 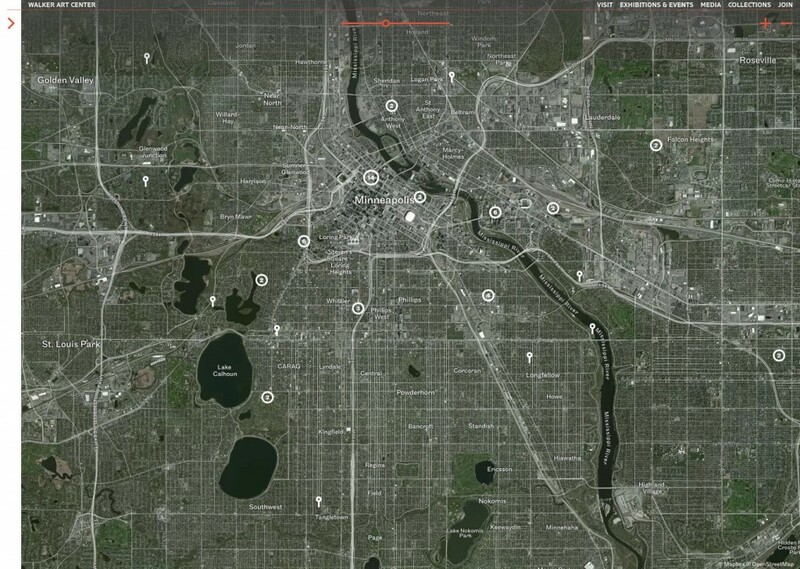 Perhaps not surprisingly, this viewing mode reveals that the selections dominate in the surrounding metropolitan area of the Twin Cities. To help correct this location bias, we’ve added a nominations feature whereby users can offer suggestions for future additions to the collection. Users can also help us correct mistakes and diversify the selections across various categories—taking advantage of crowdsourcing at its best by drawing upon collective knowledge or simply having more eyes on the page and out in the world. The virtual nature of this collection is also by design. By eschewing the object-centered nature of most museum collecting and its attendant issues of conservation and connoisseurship, the Walker is free to explore design without the normal barriers of the physical realm. In creating this virtual collection, we especially wish to include those works that cannot be collected in any practical way—for instance, a park or building due to its size or uniqueness. To these “uncollectible” examples, we have added an eclectic mix of artifacts that purposefully stretch the definition of design into perhaps less familiar areas such as food design, service design, and game design. This expansion of design belies the fact that such “new” genres were and remain integral to the Minnesota economy of food processing, retailing, healthcare, and recreational activity. 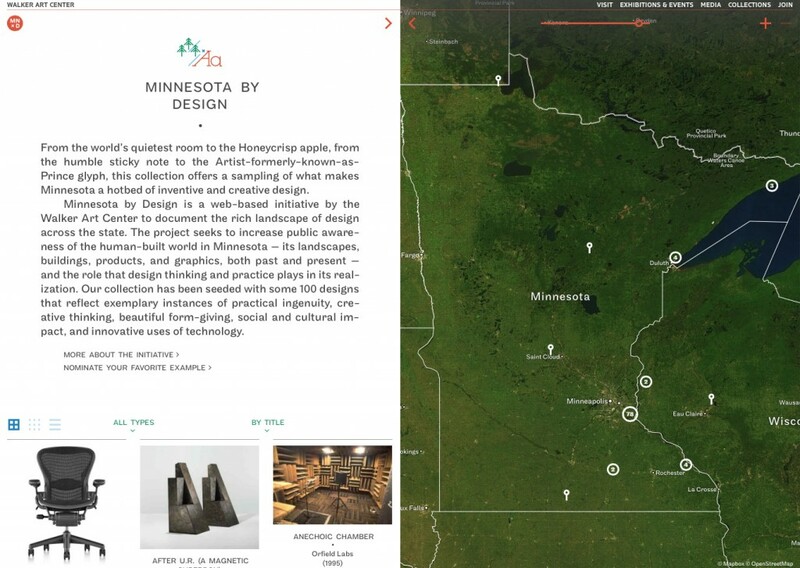 Minnesota by Design can be extended from its virtual hub to the real world. I can imagine such extensions of Minnesota by Design take the form of billboards or bus shelter ads or other outdoor media around the state to bring awareness to selected designs in all their iconic yet humble glory. 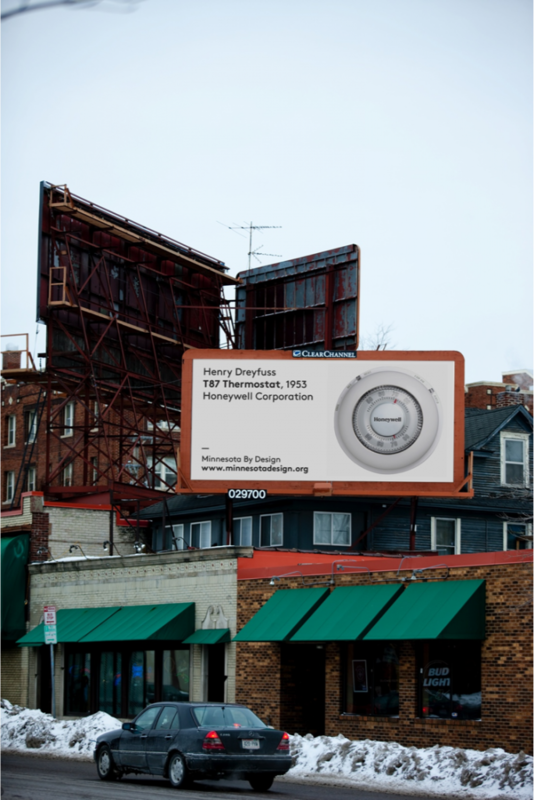 Some such ads, by fate of their particular location, could point to nearby designs: “Exit 237 to see Frank Lloyd Wright’s Only Gas Station.” One could easily imagine a smartphone app that uses geo-location sensing and augmented reality to allow visitors to “see” buildings and other things from a bygone era in the places where they once stood proud. Minnesota by Design, in any of its forms, celebrates a place often recognized nationally for making an outsized contribution to the American design scene. Part of this influence is due to the varied ecology of the state’s design scene—a space composed of boutique firms and in-house studios of Fortune 500 companies, a resurgence of artisanal practices and post-industrial technologies, a long history of public and private sector progressive civic cooperation, and with it, the fostering of what we now call a creative class economy that tends to spawn innovation and entrepreneurial activity. While the design diversity of the state makes it hard to pin down any singular aesthetic or any dominant type of practice, its design output, albeit occasionally elusive to capture, is collectible—if not physically then virtually.